* 65% less fat than USDA data for pork & beef sausage. Fat content has been reduced from 19g to 6g per 55g cooked serving. You won’t have to worry about making a meal that will satisfy the picky eater at your house when you have Premio Sweet Italian Sausage Chicken Grillers in your fridge. A healthier alternative to burgers, our chicken grillers are loaded with robust flavor and will have even the fussiest eaters coming back for more. To make a meal that’s sure to please just about anyone, order Premio Sweet Italian Chicken Grillers! Ingredients: Chicken, Less than 2% of the following: Dextrose, Salt, Vinegar, Lemon Juice Concentrate, Spices (including fennel & black pepper), Paprika, Natural Flavors. Pre-heat gas grill. Place links on grill over medium flame for 25-30 minutes. Use tongs to turn links often until golden brown. Serve and enjoy! Medium temperature in a covered pan for 8-10 minutes. Allow the charcoal to burn until it is white-ash glowing embers. Place links on the rack about 7-9 inches above fire. Use tongs to turn links often until golden brown. Allow 25-30 minutes to cook thoroughly, keeping grill covered. Serve and enjoy! Place links on broiler rack at least 7-9 inches below heating element and broil until golden brown (about 10-12 minutes each side.) Serve and enjoy! Heat a pan to medium temperature. Add 3 tablespoons water and place links in pan. Cover the pan, continue heating for 10-12 minutes, turning the links often. Remove the cover and continue cooking for 15-17 minutes or until golden brown. Serve and enjoy! Cover the links or place in a closed container. Refrigerate and serve within 2-3 days. Heat 1 link approximately 1 minute on high or until warmed to your satisfaction (adjust time according to your microwave). Sausage patties provide a versatile way to enjoy one of the staples of the grilling season. When you buy patties, you have a number of choices to prepare them. You can serve them up on a bun like a hamburger, fry them for breakfast or even crumble them into another dish. The options for these sausages are nearly endless, and now you can get them in a low-fat variety from Premio Foods. Our sweet Italian chicken sausage patties are made with 60% less fat than USDA data for pork & beef sausage. You won’t miss the fat, though! We’ve packed so much flavor into these grillers, you would never guess they were actually good for you. They have a whopping 20 grams of protein per serving to help you power through a busy day. When you eat one of our patties for lunch, you’ll stay full for hours and feel more productive instead of fretting about a rumbling stomach. Adding chicken sausage to your menu lineup gives you a lower-fat option your family will still love. While many people worry about losing out on taste when they eat healthy, these sweet Italian-flavored chicken sausage patties should eliminate those concerns. They taste so good, you’ll find your family requesting them again and again. Since the patties are free of MSG and added preservatives, you’ll be happy to oblige. Premio Sweet Italian Sausage Chicken Grillers are the newest addition to our chicken sausage family. These chicken sausage patties are filled with robust flavor. They are the perfect ingredient to make your favorite dishes healthy and still delicious. Add the delicious chicken sausage patties to our recipes for Sweet Stuffed Peppers or Festive Florentine Sausage Stacks. 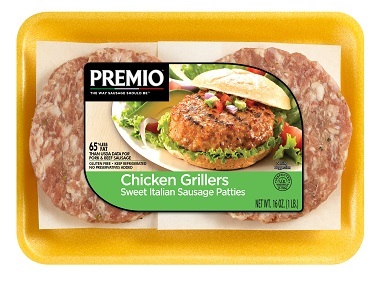 Premio Sweet Italian Chicken Sausage Grillers will certainly satisfy burger lovers! For more than 40 years, Premio Foods has been dedicated to making food that tastes great but also delivers the nutrients and nourishment growing families need. We’re passionate about our commitment to making high-quality products for our customers. Our family-owned business understands how busy life can get when you’re raising kids, pursuing a career or enjoying all the benefits of retirement. You don’t need to worry about what’s in your food. We refuse to use fillers in our sausage and believe that’s the way sausage should be. We have worked hard to find the perfect blend of spices and seasonings for our products, using butcher-quality cuts of meat to produce the best possible taste. Our commitment to quality doesn’t end with our sausage, though. We also have a commitment to helping our community, through donations to food banks or fund-raising for worthy causes. We’re also always up for a bit of fun, whether that means trying new recipes our customers send us or sponsoring contests for the best tailgating photos with our sausages. We love sharing laughs and swapping cooking tips with our customers. Use our store locator to discover a place near you that sells our sausage patties and other products, such as breakfast links and other Italian specialties. Chicken sausage patties offer a wonderful new way to try an old favorite. Spice up your meal routine today by picking up some patties for your next tailgate or cookout!